15 minutes play...BumbleBeans Inc.: Mini Finish Under the Wire? Mini Finish Under the Wire? I finished the binding on my mini Challenge quilt at 11:59 p.m. P.S.T. I had to photograph it with artificial light, so the photos are not very good. I hand quilted with Aurifil 12 weight Mako cotton color #2520. I really enjoyed this challenge. I learned that there really is no such thing as "too small". You are right. There is no such thing as too small. That alone is very liberating. Great quilt! Lovely work, Jane, very well done. Your colours all go so well together. You made it!! yay and it is just fabulous! great job-I luv it! Super little quilt! Great colors and wonderful hand quilting, too. Border is perfect! 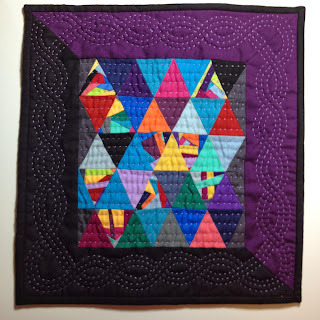 Love everything about this: the teeny scrappy triangles, the two-color border, and your lovely hand-quilting. Beautiful! Very beautiful!!!! Love the colors! Great quilting!